A sacred journey. The ironman journey can be a path towards enlightenment. I’m a searcher and a dreamer. Always have been and always will be. Blind with optimism and cheerful to a fault although this trait is usually manifested to the world in terms of my laid back nature. I’m committed to making this world a better place, to challenging my body and mind, being a role model and making the most out of each and every precious moment we have. Marking my devotion with a decision to race Ironman Arizona just a few weeks before its start; my belief in the power of endurance, its humbling nature, its ultimate challenge and the human body, mind and spirit’s ability to conquer the impossible needed to be explored on a deeper level. This path to enlightenment comes laden with rituals that man has been performing for eons. It forces one to look deep within, to diverge with our tribal ancestors to acquiesce our most basic desires. What are we if not one of the most advanced moving and thinking organisms the universe has encountered? All of life’s moments become amplified while the balancing act becomes strewn with heavy objects, you must choose wisely. What better way to test oneself than to move your body over land and sea? Let’s set a high standard and then push the limits. Let’s master a diminutive fragment of the art of moving. I rarely gave doing an ironman any thought even though I’ve always considered myself an endurance guy. Ironman’s are just ludicrously extreme. Deciding to race in October gave me only four weeks of ‘IM training’ to prepare for the grueling day. “I feel the universe inside me.” I divulge to Hortense as we lay in bed both sleepless from saving up energy for tomorrow’s big day. Six weeks of living with the discipline of a 13th century monk has come to a singularity and my energy seems boundless. The culminating effect from weeks of breaking the body down only to trick it with rest days before an event to impose overcompensation; the taper morphs my senses to be on par with the supernatural. In my heart and mind the journey is already a success, enjoying family time in the pleasant Tempe Desert in November, having supreme health and an overall sense of fulfillment. I’m grateful to share the moment with my family and friends. A full moon speaks volumes to the mood of the day while 2500 athletes and many more spectators buzz around the venue at early morning hours. Looking over the SCOTT Plasma it looks clean. Equipped with 3 water bottles, my SCOTT Carbon bike shoes, helmet, race number on a belt, Pit Stop and several salt tablets it looks like a minimalist’s approach compared to some of the bikes loaded up for the trip. I like to pack light. I go through the entire race in my mind’s eye in under a minute, careful to make sure every piece is in its place. Yep, all set. There’s about 40 minutes until the pros jump in the water. I relax and appreciate the scene. Then, you go Rogue. It’s the year 2050 and I’m 75 years old. It’s a ‘random’ full moon night in the November desert of Tempe. My wife and I venture out in the cool crisp desert air walking alone in the early morning. “You sure you want to do this? Hortense asks. “Yeah, why not, it’s shaping up to be a superb day.” Striping off the sweat suit to reveal a wetsuit I stealthily slip into the fresh water and begin a 2.4 mile voyage that will end much later in the day as I bandit the IM Arizona course from my younger days with only Hortense aware of the plans. My goal is to finish before it’s completely dark. With such a long race ahead there’s no rush to jump in the water. After a few guys take the plunge I decide it’s time to be alert and ready and make the metamorphosis with a plunge into the dark water, appreciating its curt quality. It’s almost instantaneous. The animal drive and its focus take over. In order to complete the course before dark and with no support save for a few luxuries from Hortense throughout the day I’ll have to execute one of the smarter races I’ve pursued. That and leaning on my very astounding, latest and greatest 2050 bike technology. Lining up as farthest swimmer on the left in the middle of the lake something signals the start of the race and we’re off on our quest. It is pleasing to let the body free, “ok, not too fast, here we go.” The swim’s magnificent potential blossomed with the full-moon-partly-cloudy-storms-on –the-far-horizon luminosity and color. Wow, everything about the moment humbled me as I perfected my motion through the chop. Several minutes into my swim and enjoying the effort immensely I reflect on how after sixty plus year of competitive swimming I’ve hardly slowed down. I estimate that it has much more to do with technique than any sort of genetic gift, that and a yearning to keep pursuing challenges. Nearing the halfway point and comfortably drafting off Rasmus Henning, I notice immediately when he keeps swimming past the 90 degree turn at the last buoy. I reluctantly take the lead in chasing down John Dahlz who ambitiously left the rest of us in his wake. I realize that Henning is even more in lala land than I am…but the swim is just plain fun, I can’t blame him. Finishing the swim in under an hour feels good and is well within the scope so I start the bike with all the bravado a 75 year old can muster which happens to turn out quite a few watts. Staying with my plan to keep the swim easy I slow to a pace that has someone else breaking trail after a few hundred meters of doing it myself. It stays like this until the last few minutes of the swim when Henning churns up his six beat kick and starts closing the gap on John. I lasso his legs and enjoy the ‘water skiing’ behind his wake. We spring out of the lake in a virtual tie just 15 seconds down to John. We run through the tent with the bike bags and my competitors grab their bags in the tent and slow. I obliged to skip the bike bag seeing no need for it and darted through the tent with volunteers shouting at me. I ignored them and arrive at number 43’s T1 spot all alone. A few seconds later, I hop on my stead in first position and the best laid plans evaporate in the morning sun. Riding on the course in complete solitude, no cars, no other bikers, no video cameras, no aid stations; allows me to be absolutely present in the vast desert I’m turning the crank through. I ride on, with cacti burning images of their colorful silhouettes through my mind. There is no one in front of you, the course is laid out before you; promising, enticing, urging you to race it. The intoxicating effects spell danger but you roll the die and gamble. This is way too much fun. The crowd is boisterous, the lead vehicle escorts its foremost prince, the photographers and TV cameras invade your privacy and you inhale it all. One big lung full of how to “Race like an idiot IM 101”. It is fun to ponder how little the structure of the Tri bike has changed in 40 years, albeit the gadgetry is amazing…riding a bike that is100% electronic, complete with its web connected onboard display and hands free communication system that includes the ultimate biofeedback program. There’s even a built-in lighting system as good as any vehicles on this sub 10 pound bike. The materials are lighter, stronger and cheaper, purchasing this high end bike would hardly dent anyone’s piggy bank . The best improvement, however, are tires that never go flat. Oh, and don’t get me started on the advancements in clothing, wow. My plan was not to be leading the race at the beginning of the bike, in fact I thought it important to stay in the shadows until the end of the bike, if not the end of the run. Then, you are thrust in the spotlight and what do you know, you feel pretty darn good. At the time it seems like your pace is reasonable for a 112 mile bike. The mind is calm and the effort boundless. I knew there were one or two riders behind me but I never figured out whom (Reed & Henning) until the turnaround. Here, we went straight on into a brutal headwind, my specialty. Any thoughts of relinquishing the lead abated as I see an opportunity to charge ahead and further our advantage. Much like the swim, I haven’t slowed down a great deal on the bike compared to my younger days and to this I attribute the pure and simple pleasure one can receive from exploring on a bike. Coming into our predetermined T2 Hortense is there with a few items I’ll need for the marathon. “How you feeling?” she says, and I reply with a wide grin, “pretty good.” Starting the run I’m proud to the fact that I know running the whole marathon is achievable. But really, it’s not that big of a deal. Running to the finish line at dusk Hortense captures a photo, our lone trophy for the day. Hortense gives a hug, “Good job, how was it?” “Fun….You ready to do yours tomorrow?” “Oui!”. After her fun day in the sun we’ll be heading home to enjoy time with family. After the 1st of three laps I come back to the crowd still holding my lead and feeling good about it. Past mile 45 at one of the Beeline Hwy aid stations I slow to carefully obtain fluids and Reed pulls into the lead for the first time. The amplified situation of holding the lead subsides, suddenly the race feels much easier. It is eternity, how long we’ve been racing and how long we have left. There is a huge difference between setting the pace and matching someone else’s, I smile about how good it feels now. After too short a time I brazenly take back the lead. Miles 45 to 65, Reed and I take turns on the front with Henning too smart to give up his third position. He later tweeted to Reed that they went out way too fast. Just before the half way point of the bike Rasmus goes to the front and when passing me says impressively, “good job” and proceeds to up the pace. Around mile 60 I’m enjoying being in the third position for once and look up to notice Reed has let a gap develop. I don’t want to waste any more energy than I have already so I wait for him to close the gap. It gets bigger. A moment of truth. The smart racer would hold back and wait for Rapp, Bracht, and Lieto to close the gap, who have not caught us yet but can’t be too far back. But I’m not having anything to do with racing smart. I’m racing with daring audacity. I stand up, pass Reed and start closing in on Rasmus. A few miles later and seconds from catching Rasmus I come to a bottle neck of age grouper passing age groupers being passed by me. As I’m carefully navigating the pass at high speeds, the motto ref decides to help and yell loudly and repeatedly, “on Your LEFT!” I was thinking, ‘boy, the ref is really getting ticked at the age groupers’. Then realized that the ref was not yelling, it was Rapp yelling at me. So we have age groupers passing age groupers being passed by me being passed by Rapp. We work the situation out quickly and without incident save for all the yelling. We have an entourage at the front of the race, the characters; Jordan Rapp, Rasmus Henning, Timo Bracht, Chris Lieto and me. We come to the special needs aid station with Rapp and Bracht charging right through it. I come up to the volunteers, slowing and hollering my race number hoping for a quick exchange. I’m ignored or the volunteers are ill prepared for us but I miss out on my bag and the 750 calories of yummy Carbo Pro + Nuun. It takes an extreme effort to catch back on to the leaders that skirted the section for any advantage it offered. The pace didn’t let up and I remember thinking how crazy fast these guys are going, there is no way they can keep this up. I ride with no feedback on my bike but I’m sure we were maintaining 400+ watts for several miles. Sure enough, just before completing the 2nd lap the pace becomes pedestrian if for no other reason than the fact that I am riding at a very comfortable effort. Sensing the calm before the storm I brace myself for what promises to be a daunting final lap. The wind becomes more of a factor swirling in all directions and never feeling like its aiding while the pace picks up but not approaching anything like what we did miles 65 to 70. Lieto and I exchange turns at the back and reason creeps into my mind for once as the days shameless effort becomes evident. At this point I’ve been working on my first pee for the last 20 miles but the discomfort is growing with nothing happening. It is becoming more than just an irritation. I focus on this sole act for several minutes to no avail. It becomes evident that for this to work I’m going to have to stand and slow down. I try this a few times with still no luck and now I’ve lost some time to the four super fast cyclists in front of me. Passing the last turnaround and closing in on 95 miles I’ve lost contact with the 4 leaders. A cloud burst releases its energy and the winds kick up to their most ferocious on the day. I pee a couple more times and go through more than a few sections of soft pedaling. Just past the 100 mile mark I’m happy to have the company of another competitor as Tom Lowe whisks by. I hope this is just the carrot to get me home faster. Lowe is killing it though, slicing through the wind with fantastic speed. I stay with him for no more than a few pedal strokes putting out only a fraction of the power I had a few miles earlier. I’ve hit a wall but it pales in comparison to many of the walls I have ran into while racing much shorter distances. However, there is still a marathon to compete. I’m nearing the finish when suddenly I’m surrounded by shouting spectators on a side walk clearly off course. ‘How’d that happen?’ I wonder. A volunteer yells at me to go back, I ignore this request and cast my bike to a guy on the other side and proceed to jump the precarious fence. I’ve already lost time and this is a scrambled attempt at minimizing any more donations. My legs cramp up at the apex of the fence and I fear falling awkwardly to the pavement. Luckily, I land on two feet, jump back on my bike, clip in and pedal the remaining couple hundred meters to the mount line. In T2 I threw on my SCOTT T2’s effortlessly and quickly; my transitions turned out to be the fastest on the day save for the 1 second, eventual race winner Timo Bracht put on me. To my delight my running legs found their stride immediately feeling light and fresh. I backed off on the pace I felt I should be going in an effort to be conservative. If only the bike had scared me into this kind of submission. I quickly pass James Bonney who just barely passed me at the closing moments of the bike. Then, Jozsef Major reeled me in and passed me running low 6 min per mile pace. For around the next hour I ran comfortably solo in 7th position and passed a walking Lieto at mile 14 for a brief stint in 6th position. It wasn’t too much further before I too slowed to a walk , the culprit of screaming mad quads. Matt Reed then steadily ran by, beginning the onslaught of countless runners that would soon be passing me. I tried to run several times but it didn’t stick until 10 miles later at mile 24 when smelling the barn became enough to ignore the revolting thighs. Somewhere around mile 18 Chrissie Wellington ran by putting forth a massive effort in route to a World Record Performance! In the end, the relief of finishing is hard to deny. I knew that the bold effort on the bike probably let slip away what could have been a break-through finish but I wanted to test the limits; I found them and then had to keep going. The journey, in all its splendor, proved thrilling and learning from the experience will be indispensable. After a few weeks of down time which can oddly prove difficult, it will be a winter wonderland full of training opportunities here in Idaho letting the build up for an exciting 2011 campaign commence. Timo Bracht weathered the specter of two speedsters in a heated footrace and held on to win the 2010 Ford Ironman Arizona. Chrissie Wellington put on a dominant performance to win the women’s title in 8:36:13 and finished 8th overall. Arizona’s version of the 140.6 distance is often a nail biter, contracting rather than expanding as the men’s race draws to a close. In 2008, the top four men crammed into two minutes by the time they reached the tape. The 2010 edition was almost as close, with Timo Bracht holding off Denmark’s former short course star Rasmus Henning, 8:07:16 to 8:10:58. British IronRookie Tom Lowe, came third in 8:11:44. Defending Ironman Arizona champ Jordan Rapp crossed next in 8:16:45. The day started with Kevin Everett and Brandon Marsh exiting the swim along with John Dahlz, James Bonney, Henning and Reed. Everett, Henning and Reed gained separation quickly and put two minutes on the chasers. Meanwhile, Bracht, Jordan Rapp and Chris Lieto each commenced their attempts to close down gaps of 4 and 5 minutes out of the water. Just after halfway into the bike, Rapp—racing his first Ironman after a horrific bike crash in training almost cost him his life—took over the lead. He towed Lieto, Henning and Bracht, almost never relinquishing the front, until mile-90, when Bracht made a move. Within a mile the German’s pace dislodged Lieto. Meanwhile, Lowe, a duathlon specialist, steadily kept pace with the leaders, albeit while hovering 3 to 4 minutes in arrears. Rapp and Bracht and Henning entered the final straight into T2 together, with Lieto :45 back. But Henning had to make a stop to serve a 4-minute penalty for drafting—he might have won the race had he not tried to calibrate to calibrate the draft zone a little too closely. Bracht immediately ran to the lead, putting several seconds a mile in Rapp. The hot pace on the bike appeared to take its toll on Lieto, who lost ground on the leaders from the marathon’s first mile. While Bracht, Rapp and Henning were each running 6:15 to 6:20 pace, Lowe was racing over the pavement as a pace close to 6-flat. By 12 miles into the marathon the Brit—who happens to be Chrissie Wellington’s boyfriend—had closed to within 3 minutes of Bracht. Henning hovered at just over 3 minutes down. By mile-14 Lowe was only 2:11 down on the leader. At mile-20 Bracht still held the lead, yet, as is the habit at this race, the leaders were coming together. Lowe was a scant 80 seconds back, with Henning less than 2 minutes out of the lead. Rapp was in fourth, but, still only a very few minutes down. Lowe’s torrid pace in the early miles required repayment. Henning found good legs during the marathon’s second half and retook the second spot from Lowe. But Bracht—who has a habit of strong marathon finishes himself—stretched out his lead, while running a 2:48:59. Lowe and Henning ran the fastest two run splits, 2:48:12 and 2:48:35 respectively. Rapp’s 4:22:38 bike was only 7 seconds slower than the course record he rode last year, and his 2:58:02 run just 2:17 than his run when he won the race in 8:13:35 and set the overall course record Bracht erased today. It’s good to see Rappstar back. “This was my Kona!” shouted Chrissie Wellington. This, after demolishing the field at Ironman Arizona in a World Best time (for an Ironman branded full distance event) of 8:36:13. Wellington already holds another World Best at this distance, set at Roth earlier this year in 8:19:13. Wellington, who finished 7th place overall at Roth during her record run, crossed the line in 8th place here. Her 2:52:55 marathon would have put her only 4:44 behind the fastest men’s run of the day. In fact, Wellington’s swim was only 32sec slower than that of men’s winner Timo Bracht, and her run was only 3:56 behind Bracht’s run (and this, while executing the Blazeman Roll at the finish). It’s a good thing the German bikes well! The day started without Wellington displaying her dominance. Her two countrywomen, Rachel Joyce and Leanda Cave, gave the Brit a go for the first three hours. The trio were in a virtual dead heat 50 miles into the bike ride. But Wellington, perhaps her 2010 Kona demon exorcised, chose that moment to stomp on the pedals, and Cave and Joyce were left to eat Sonora Desert dust. By T2, Wellington had 12:20 on Cave, with Heather Wurtele and Linsey Corbin giving chase 17 and 18 minutes behind. Corbin proved the best of the runners—Wellington excepted—coming home in a very credible 9:05:33. Corbin’s time was an improvement on her 9:13:46 she posted last year as runner up, and had she done this year’s time last year she’d have enjoyed holding Arizona’s course record for the past year. Cave followed in 9:13:50. The seventh edition of Ford Ironman Arizona includes one of the strongest professional fields a domestic Ironman event has seen in years. The men’s race is highlighted by defending champion, Jordan Rapp, Denmark’s Rasmus Henning, Germany’s Maik Twelsiek and Americans Chris Lieto and Matt Reed. An equally stacked women’s field includes Great Britain’s Chrissie Wellington (pictured winning Ironman 70.3 Timberman) and Rachel Joyce, Canadian Heather Wurtele, Hungarian Erika Csomor and American Linsey Corbin. 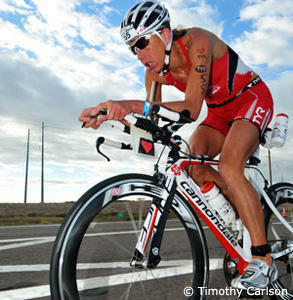 Rapp, of the U.S., is back to defend his Ford Ironman Arizona title and the course record he set last year. He was involved in a severe bike accident in March and this is one of his first races since the incident. Henning, who spent eight years on the Olympic-distance circuit, finished first at Ironman China and fifth at the Ford Ironman World Championship in 2009, his first year of full-distance racing. After finishing 23rd in Kona last month, Henning is hoping to end the year with a top placement in Tempe. 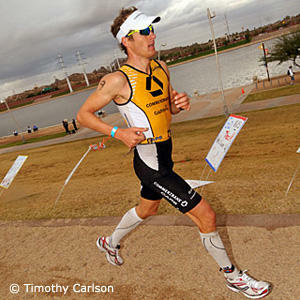 Twelsiek celebrated his first Ironman victory at Ford Ironman Wisconsin in 2007 and won at Ford Ironman Lake Placid in 2009. Lieto has finished in the top 10 at the Ford Ironman World Championship three times, highlighted by a second-place finish in 2009. This year, Lieto took the titles at K-Swiss Ironman 70.3 Kansas, Ironman 70.3 Buffalo Springs Lake and Ironman 70.3 Vineman. 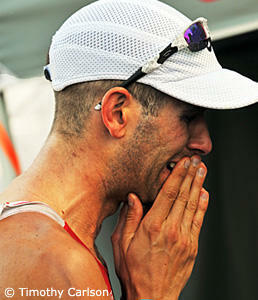 Reed, a skilled short-course triathlete and Olympian, hopes to find success in his first attempt at the full distance. Wellington, a three-time Ironman World Champion, surprised many when she pulled out of this year’s Ford Ironman World Championship on race morning due to illness. Ford Ironman Arizona marks her first time racing in a domestic qualifier event. Corbin’s resume includes a fifth-place finish at the 2008 Ford Ironman World Championship and the win at this year’s Ford Ironman Coeur d’Alene, her first full-distance title. In 2008, during her second year as a pro, Wurtele won Ford Ironman Coeur d’Alene with a time of 9:38:58. Csomor, the winner of the April 2008 edition of this race, is also a title holder at Ironman 70.3 Austria and Ironman 70.3 California. Last year, Joyce placed third at Spec-Savers Ironman South Africa, second at Ironman Lanzarote Canarias and, most notably, sixth at Ford Ironman World Championship. She returned to Kona this year and again claimed sixth place. Approximately 2,500 athletes representing 50 states and 30 countries are expected to race in the seventh-annual event. Ford Ironman Arizona offers a total professional prize purse of $50,000 and 65 qualifying slots to the 2011 Ford Ironman World Championship, to be held in Kailua-Kona, Hawaii, on Oct. 8, 2011.